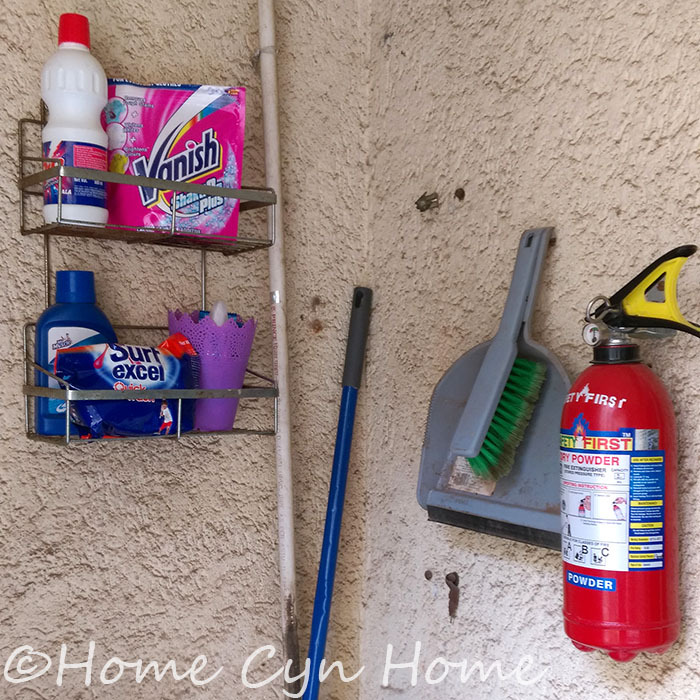 One of my reader asked a very pertinent question in my blog post about the best cleaning tool to have in your home. Namely, how I manage to store all of these in my home. Because if you live in a metro in India, let's face it, you are dealing with a serious space crunch. Mumbai apartments are notoriously tinier than in other cities at often, inflated prices. Yet, I still own a tall broom, steam mop, flat mop, dust control mop, squeegee, and enough mop refills and dusters to go through a whole week of cleaning. Not mentioned in the previous blog post, I also have a ladder and one of these fancy spin bucket mop thing my previous maid forced us to buy. And guess what? I store it all on our utility balcony at the moment. Well at the exception of the squeegee which resides in our tiny bathroom (no picture of that to come below, sorry). In this flat, I decided to repurpose our super old, super broken and rickety shoe cabinet as a cleaning tool station. 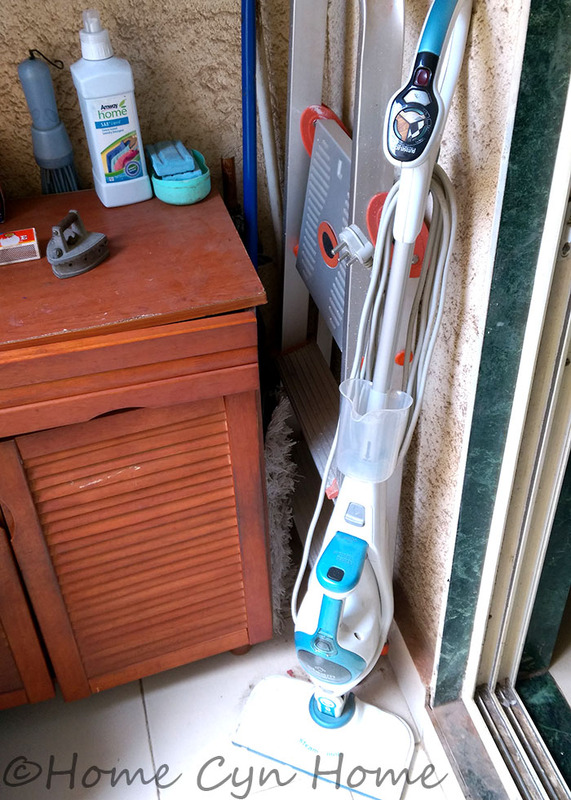 As you can see on the right, not only do I store my cabinet, but the steam mop and dustbin as well, on the left side, out of this picture frame is the washing machine (more on that further down this post). If you scroll back to the full view of the shoe cabinet, you'll notice the green handle of my Scotch Brite flat mop poking out. If you haven't read the cleaning tool post (and you should), you don't yet know that I use the same handle for BOTH the flat mop and my Tall Gala broom. And when I am done with the cleaning and ready to store that stick back in that corner its ALWAYS with the broom attachment on. The flat mop attachment is stored, along with all its mop pad refills , inside the cabinet. I change the cleaning pad on my mop everyday, so when I am done moping, I peel of the pad and toss it next to the washing machine. When I took this picture I was cleaning a load of mop pads, duster and dish towels (I change dish towels daily too). But before I have enough to start a load, I toss them behind the green bucket, where the pipes are. One day I'll have a dedicated laundry hamper for these as I wash them separately from regular clothes. 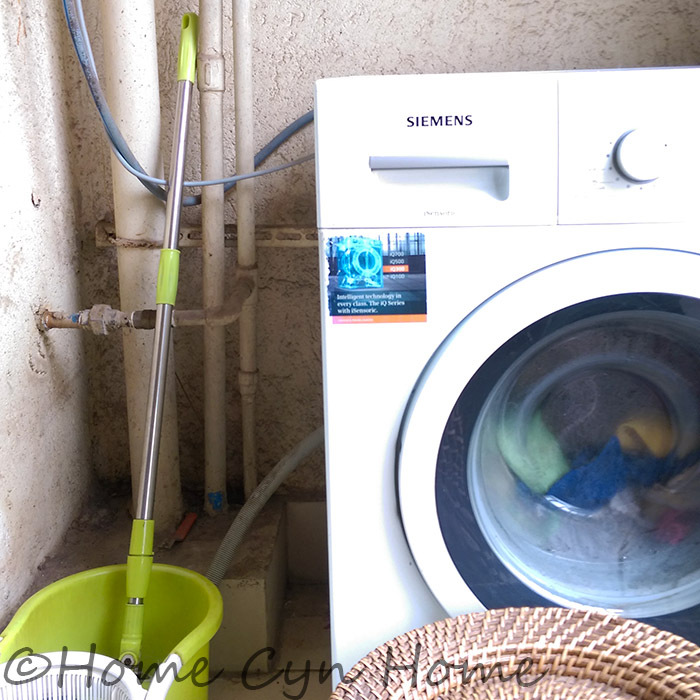 A note on the spinning mop, we actually still use it, even if it didn't make the cut for my best cleaning tools post. It comes in super handy to mop a spill in the kitchen (my dog can't drink or eat without making a mess) or quickly get rid of a dirt spot anywhere else in the flat. Like for everything else, I own refills for that mop too, and like all refills, they are stored in the cabinet opposite the washing machine. But back to the storage cabinet side shall we? This is the right hand side of said cabinet, and this is where I store the dust control mop (long blue handle) the aluminium ladder, and the steam mop. 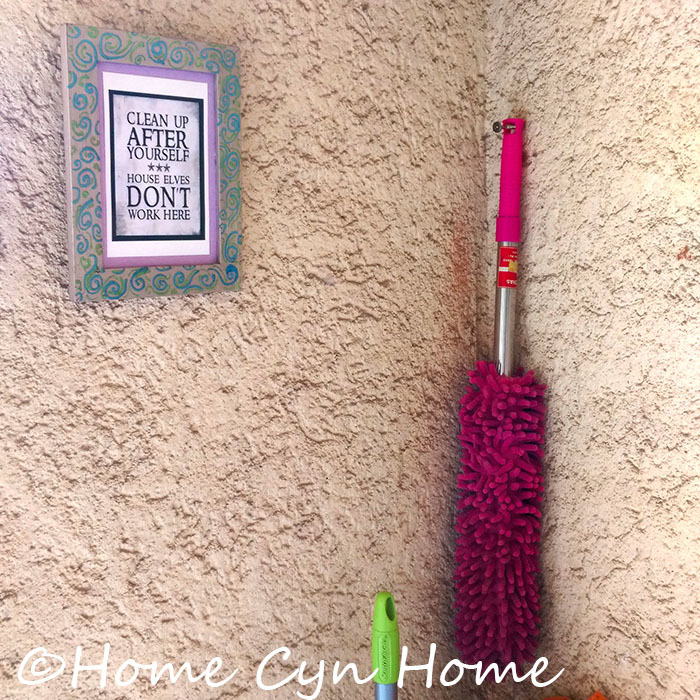 I store the dustpan and brush set I mentioned in the other blog post on a screw in the wall. Right next to a fire extinguisher that our society co-op has given us for free as part of their fire safety campaign. I also have a wire rack holding some laundry odds and ends directly above the storage cabinet. On the left hand side of the cabinet, I hung my ceiling dusting wand on another screw (and a home decor touch, just because). On top of the cabinet I have a small shopping bag (the black one) that holds all the kitchen wipes, dusters and sponges that are clean and ready to use. I discard my kitchen wipe daily tossing it in the laundry pile in the evening. The top drawer of the cabinet holds the garbage bags, and kitchen towels, which again I toss in the laundry daily too. All the shelves inside my cabinet unit hold the spare mop pads, steam mop attachments, and empty shopping bags. The tiny plastic bags kirana stores still like to give with your purchase are neatly folded and interlinked in that repurposed tissue box on top of the cabinet. The only cleaning product I keep outside is my laundry detergent (the bottle on top of the cabinet in the first picture). I kept everything contained in two plastic caddies to prevent total chaos, and that way if I go on a huge cleaning spree around the flat, I just have to pull the green basket out and toss in a few sponge wipes and dusters and I am ready to go. I am pretty sure I heard some of you think that this is only possible if you live in a flat with an utility balcony big enough. And yes, you might be somewhat right. In the sense that not all utility areas are big enough to accommodate an old shoe cabinet. This is the first time I actually can do that, but I didn't wait until I moved to this flat to have all those cleaning tools, in fact, some of them have been with us for years. So how did I keep my gear organised in the past? I simply got a bit more creative. 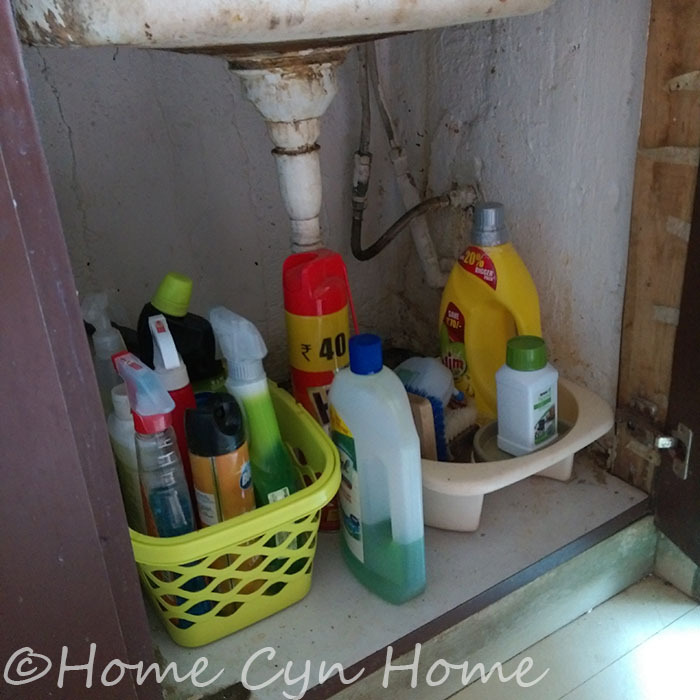 In the previous flat, I had enough space for the mop and ladder next to the washing machine, and tossed the mop bucket under the sink and all the cleaning supplies on a shelf in one of the kitchen cabinet. I also turned the bathroom in Ishita's room as a broom closet, storing all the cleaning tools we didn't use daily behind a shower curtain. This was the utility space in that flat if you remember my groovy wall border blog post. It was also the tiny space I used as a photography studio of sort. 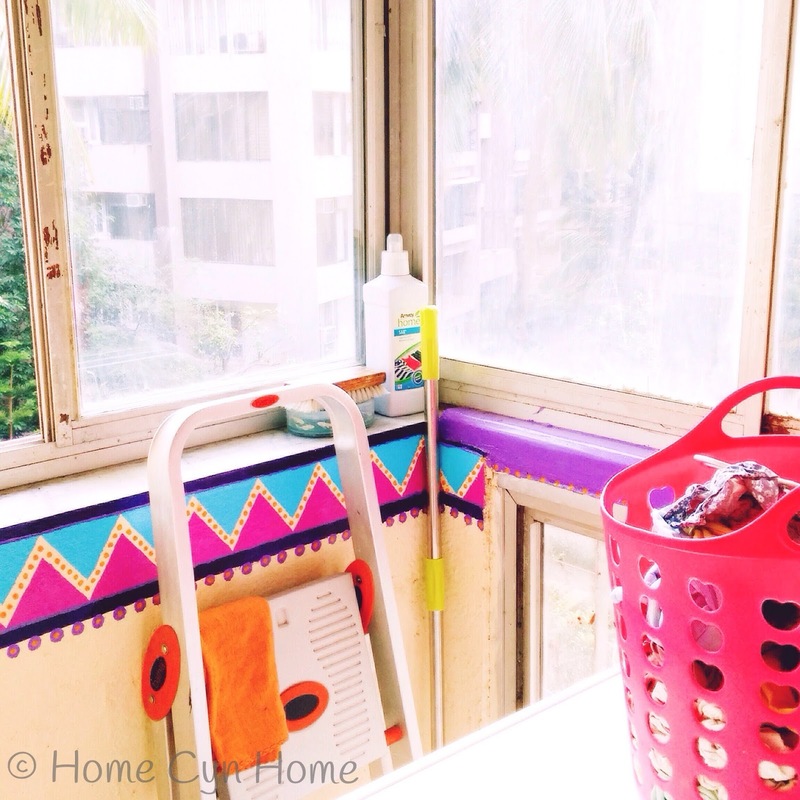 When you live in small spaces, it pays to learn how to make a space work for several things. Pardon the blurry picture, I didn't care much about blog photography in 2012. The point of this picture is that we had a very tiny space for the washing machine in that flat, and all that could fit beside it was our very industrial looking metallic shelf unit. I had a toddler in the house back then, so having a lot of crap stored in full view was not and option, but there was no other place to store said crap. So, I just attached a shower curtain to the shelf unit and hid all the mess behind. It included old books, cleaning products on the highest shelf, and of course all these dusters and stuff that are currently in my repurposed shoe cabinet. Back then we only had the flat mop, a bucket, broom and squeegee. It all fit on the tiny "balcony" off the kitchen along with the dustbin. The point is that you don't need to have a super big, super fancy, super everything space to have the necessary cleaning tools. Over the years and moves I have made the craziest spots work for my stuff. I mean, HELLO!!!!!!! 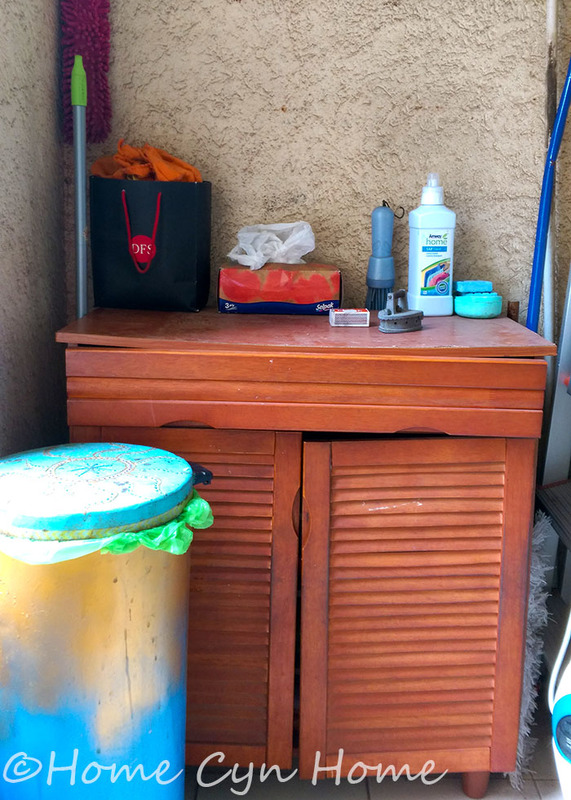 In that still beloved roof top terrace flat in Bangalore, we had the washing machine set up on top of the Indian toilet we never used in the main bathroom if that says anything. The thing with tiny spaces is really that you have to think outside the "box" to get the best out of it. And contrary to preconceived some have about Westerners, we didn't all grew up in big houses. In fact your average Genevan flat in Switzerland is likely to even be tinier than flats in Mumbai. The secret to good space management and storage is to stop thinking of your home in term of surface, but start thinking about it in terms of VOLUME. It's not just square feets you live in, it's CUBIC feet. In most Indian flats with high ceiling, that means that you have 2.5 meters to go vertically for storage. 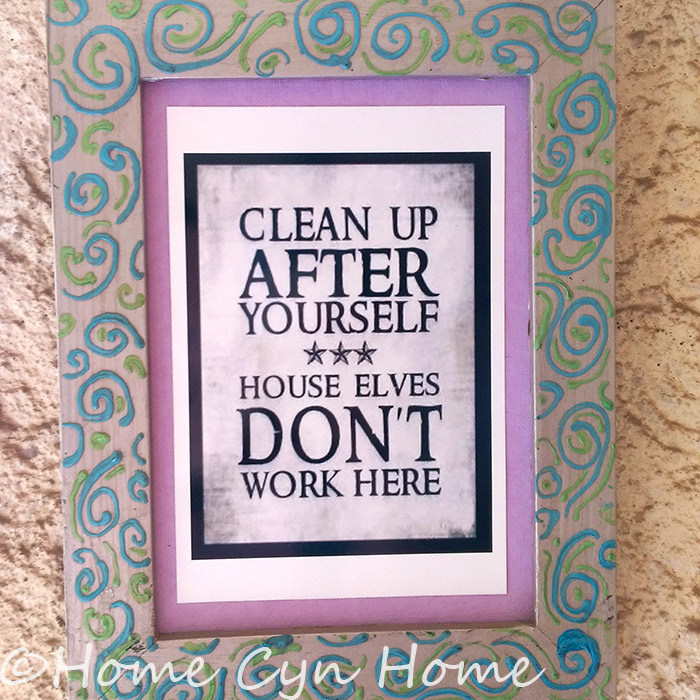 So do not let the perceived tiny-ness of your home stop you from getting the right cleaning tools, instead, start exploring your options in the space you have. Great post! It's fun and helpful to see how other people make storage work. I am lucky to have a laundry/utility closet in our current apartment. It's half the size of our former house, but the storage is so much better now. I have a washer and dryer in the laundry closet, and I have four very long shelves. I also use it as my linen closet (for sheets, towels) as well as a place to store cleaning products. I also fit two types of hampers for dirty clothes. It's full! I think it's easier to keep a smaller apartment clean, and there is definitely less wasted space. It makes me question the stuff that I hang onto! Since we moved recently, we did go through a great purge before moving, and there was still a lot of stuff we managed to hoard despite having less storage space than in a big house. And for now the trauma of sifting through pile of crap is still fresh, so I resist the urge to re-build that collection of empty jars (I still have a lot of them left) or empty take out container to store stuff, even though last night I ordered Dim Sums from a new place and it came in the cutest packaging ever. I almost threw those cute trays into the sink to wash, but then remembered that A) I didn't have a project for them in mind just yet and B) I didn't really feel like adding more dishes to wash to my to-do list (I hate doing the dishes). So in the bin they went. 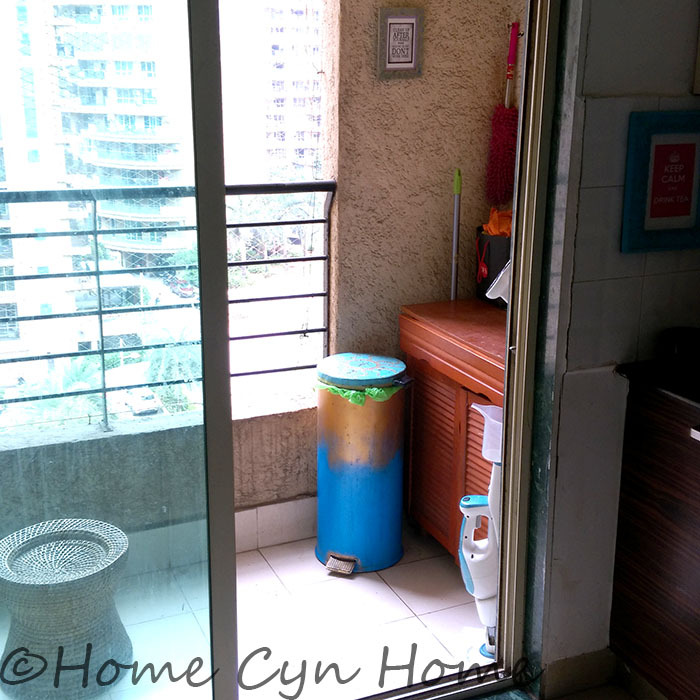 Loved reading your post which addresses the most common of of hoarding habits and clutter issues.When will indian flats the 1 2 3 BHK be equipped with a tiny utility area. The issue with dry and wet and all those balconies is the layers or dirt and bird droppings they are prone to. Meaning I always end up cleaning these more than the actual living space. 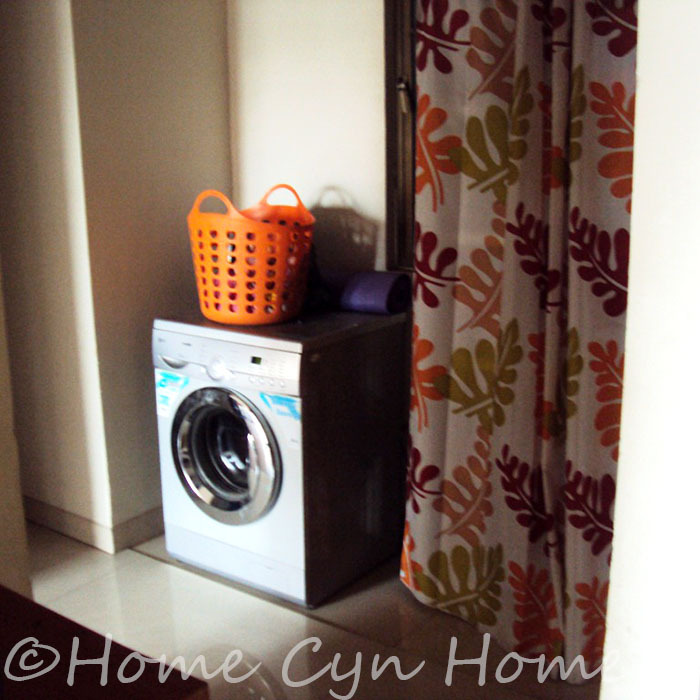 I hate how washing machines in particular are exposed to the elements even in the most modern flats. It reduces the life of the washing machine and is a giant pain in the bum to keep clean. In this current flat we live in, we fond out that during the monsoon the rain lashes straight in that utility balcony wetting everything. We kept a plastic sheet and a towel on top of the washing machine just to keep the water to get into the buttons on the control panel!